HWS seeks to acquaint people with diets, values, therapies and lifestyles that help to establish wellness within themselves and their families. 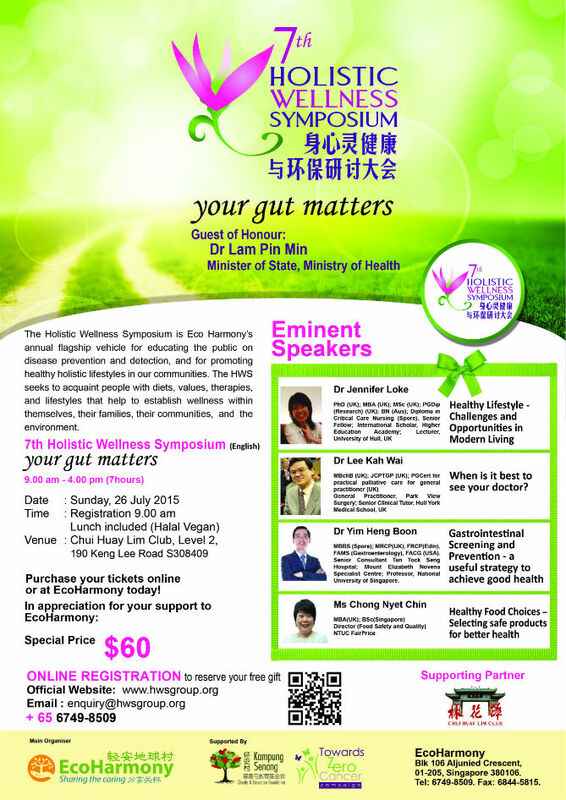 This year’s symposium, entitled “Your Gut Matters”, will be on 26 July 2016. Gut, or the human gastrointestinal tract (HGT), is the door to vibrant health. The symposium will discuss ways to promote and maintain a healthy and functioning HGT, and symptoms or warnings signs that indicate something may be amiss with our gut or digestive system. Dr Lam Pin Min, Minister of State, Ministry of Health will be the Guest-of-Honour at the Symposium. Among the eminent speakers are: Dr Jennifer Loke, Health and Social Care faculty lecturer at University of Hull; Dr Yim Heng Boon, senior consultant gastroenterologist and hepatologist, Mount Elizabeth Novena Specialist Centre; and Ms Chong Nyet Chin, NTUC Fairprice’s director of food safety and quality.